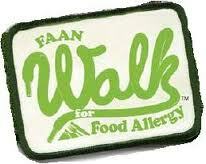 We are once again participating in the Food Allergy & Anaphylaxis Network (FAAN's) Walk for Food Allergy in Boise, Idaho on October 22nd. The event will raise funds to find a cure for food allergy and to educate others. FAAN's mission is to raise public awareness, provide advocacy and education, and to advance research on behalf of all those affected by food allergies and anaphyaxis. Please support our fundraising efforts with a donation. Your tax-deductible gift will make a difference in the lives of the estimated 12 million Americans with food allergies and their families. You can make your secure credit card donation by selecting the Support Me Button. Do you want to join our team? We'd love to have you. Any amount helps us reach our fundraising goal. Last year we raised a little over our personal goal of $250-. Our goal this year is to double the amount and raise $500-. We appreciate any support you can offer.